In between wrapping our head around the fact that it’s less than 17 weeks until Christmas (and breathe...), we still found time to gather our favourite articles from the week. The tech industry has diversity issues, that’s no secret. So, it’s good news to hear that The Department of Digital, Culture, Media and Sport has launched a £1 million fund for initiatives helping those from diverse backgrounds to get digital jobs. In addition, a £400,000 Digital Inclusion Fund will be used to help elderly and disabled people acquire much-needed digital skills. You can read more about it at Alphr. Independent creative company, Mother (New York office), has teamed up with New York Public Library to make Insta-Novels. In summary, a book, short story or novella is digitalised by being uploaded to the “stories” section on Instagram in order to “make some of the world’s most classic pieces of literature more accessible to the masses.” The service launches with Lewis Carroll’s Alice in Wonderland and you can read more about it at It’s Nice That (not on Instagram). A new colour search tool, which presents you with a plethora of colour options when you search a term, has based its choices of the first thing that comes up on Google image search. Fast Company has called the tool “a quick and handy way to get color ideas for a design project, especially because you can type in more emotional, evocative words and see what Google instantly associates with each idea”. Read about it here. Number 4 - Targeted messaging, is it worth the hype? In an article in Campaign, renowned journalist Rory Sutherland argues that targeted messaging is just a small part of the advertising mix and that tech companies have misled advertisers into thinking that message delivery is the final answer. In the entertaining and interesting point of view, Rory reminds readers not to forget about creativity and human interaction. 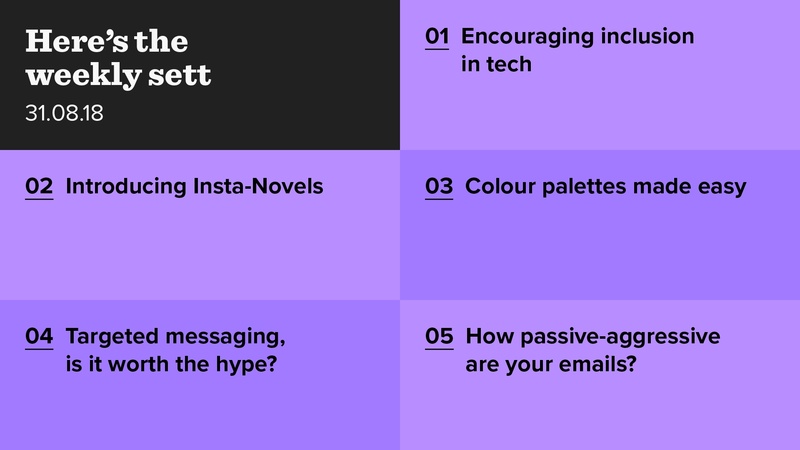 Number 5 - How passive-aggressive are your emails? At Red Badger, we mainly communicate on Slack but it didn’t stop this Guardian article making us laugh. The piece rounds up the most annoying phrases used on work emails, from ‘per my last email’ to ‘reattaching for convenience’.